This is going to be short and sweet, because, really, what can I say about Harry Potter that hasn’t already been said? 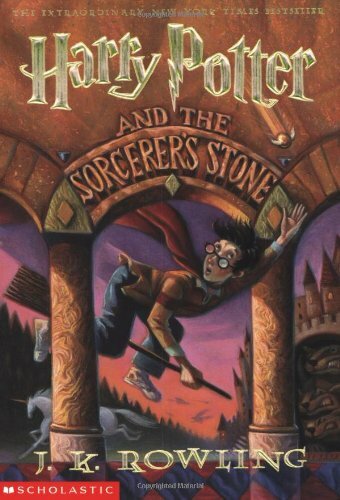 I finally read it – the first book of the series, anyway – sixteen years after it was published, and almost as many since it became one of the biggest deals in children’s literature. I hadn’t planned on ever reading it, but I appreciated Rowling’s The Casual Vacancy so much that it warranted, finally, a look at what else she’s done. On the off chance that you haven’t read Harry Potter and don’t know what it’s about, it’s about a young boy in contemporary England who is orphaned as a baby and unwillingly taken in by his mean aunt and uncle. The circumstances of his parents’ demise are rather mysterious, but it’s well known – at least among witches and wizards – that it was at the hands of the evil Voldemort, although Harry believes that they died in a car accident. Poor Harry, neglected and abused by his aunt and uncle and tormented by his spoiled cousin, has little to look forward to, until one day – shortly before his eleventh birthday – a letter arrives for him. Actually, a deluge of letters, the contents of which have his aunt and uncle scrambling to ridiculous lengths to run from. Finally, the letter catches up with them on a deserted, storm-swept island, by way of Hagrid, a giant and gamekeeper of Hogwarts, the premier school of witches and wizardry to which Harry is being summoned by the letter. And so begins Harry’s education as a wizard. It is at Hogwarts that Harry learns of the true circumstances of his parents’ death, his own seemingly royal status, and where he befriends Ron Weasley and Hermione Granger who accompany him on his many adventures. Harry proves to be a good student, a formidable Quidditch player, and a brave wizard who finds himself in numerous scrapes in his quest to fight evil. The beginning of the book reminded me very much of Roald Dahl’s writings, and although I’m not much a fan of fantasy, I enjoyed the book and can see what kids find so appealing about it. Rowling is a talented and imaginative storyteller; I’m looking forward to reading her newest grown-up book. Maybe I’ll find time to read the second Harry Potter book before too long. Keep reading the series. It gets better! Yes. What Megan said. 🙂 I’m a hopeless fan!